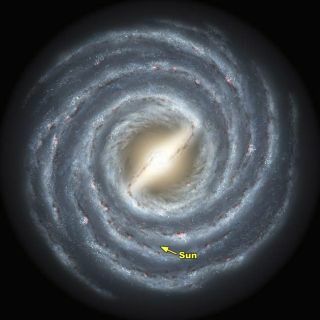 An artist's rendering of the Milky Way and its central bar structure, with the Sun's position noted. A new infrared survey that claims to be the most comprehensive structural analysis of our galaxy confirms previous evidence for a central bar of stars. The bar is embedded in the center of the galaxy's spiral arms and cuts across the heart of it all where a supermassive black hole resides. The survey found that the bar is longer than thought and sits at a sharp angle to the galaxy's main plane. "This is the best evidence ever for this long central bar in our galaxy," said Ed Churchwell, a University of Wisconsin-Madison professor of astronomy. If you've ever been fortunate enough to see the Milky Way in the night sky, then you can appreciate the frustration astronomers face trying to probe the galaxy's center. The milky swath of stars visible under a dark, rural, summertime sky represents a fraction of the millions upon millions of stars that crowd the center of the galaxy. We sit on the outskirts, looking in. Seeing through the glow to determine the galaxy's structure is hard. Even more challenging is peering through all the dust between here there. The survey was done with NASA's Spitzer Space Telescope, which records infrared light. All objects that emit any heat can be seen in infrared, and this wavelength penetrates dust, so the new survey revealed light from tens of millions of stars hidden to optical telescopes. The bar is made of relatively old and red stars, the survey shows. It is about 27,000 light-years long, or roughly 7,000 light-years longer than previously thought. Churchwell's team also found that the bar is oriented at about a 45-degree angle relative to the main plane of the galaxy, in which the Sun and the other spiral-arm stars orbit. Other stars exist outside the galaxy's main plane. The Milky Way, like many galaxies, is surrounded by a sparsely populated spherical halo of stars. The main galactic disk is about 100,000 light-years wide, and the Sun sits about 26,000 light-years from the center. Bars are fairly common in large spiral galaxies, but some do not have them. Astronomers had glimpsed ours and were not sure if it was in fact a bar or perhaps an ellipse. The results will be published in the Astrophysical Journal Letters.